Hang out right in your living room! This space-savv- ing stand supports single point therapy swings and chairs. It’s also height adjustable so you can raise or lower your swing to fit your space. 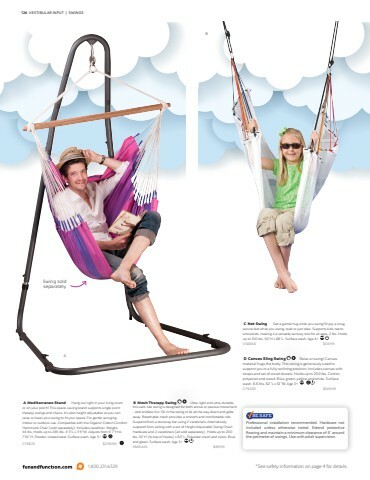 Compatible with the Currambera Hammock Swing Lounger and Orquídea Hammock Chair (sold separately). Weighs 71 lbs. Holds up to 285 lbs. 47”H x 20”L x 6”W. Powder-coated steel. This comfy and colorful hammock-style chair is roomy enough for both adults and older kids. Supports active swinging and gentle rocking. Hang from single suspension point or frame such as the Mediterraneo Stand (sold separately). Rotates 360 degrees with integrated swivel. Weighs 4.6 lbs. Holds up to 287 lbs. 61”H x 55”L x 41”W. Spreader bar is 43”W. Durable, tear-proof cotton is machine washable. Bamboo bar. Choose from jungle (green stripes) or lagoon (blue stripes).